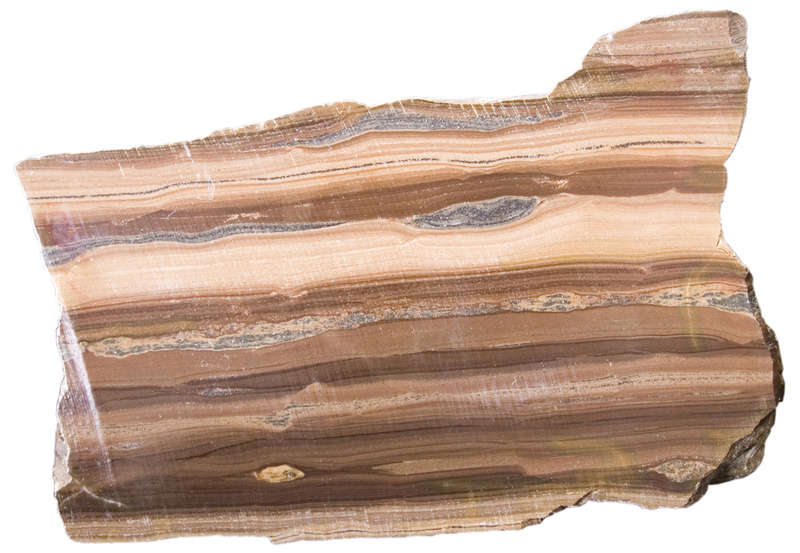 Oil-shale sample from the Green River Formation showing dark bands of kerogen. The Utah Geological Survey (UGS) has conducted resource studies of oil shale and shale oil for over 20 years. The two topics sound like the same thing, but they are actually very different in terms of oil exploration and development. Utah’s oil-shale deposits are located in the Uinta Basin of northeastern Utah. The estimated in-ground resources are over 300 billion barrels of oil—some of the largest oil-shale resources in the world. For decades many politicians and scientists have touted Utah’s oil shale as the energy of the future. However, fluctuating oil prices, technical challenges, and major environmental issues have precluded any commercial oil-shale production in Utah. 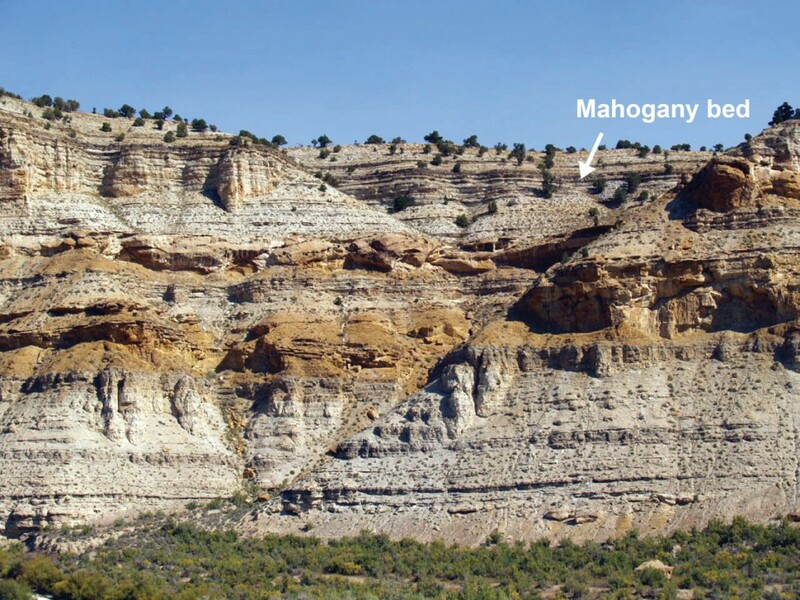 Utah oil shale was deposited as organic-rich sediments in a freshwater lake (Lake Uinta) about 50 million years ago (see related article by Michael Vanden Berg, Survey Notes, May, 2011, v. 43, no. 12). These deposits are found exposed around the Uinta Basin’s rim in the Green River Formation—also a major oil and gas producer in the subsurface of the basin. Shale is a fine-grained sedimentary rock composed of mud containing clays and silt-size particles of other minerals. Some shale can also contain significant amounts (5% or more) of organic matter—the fossil remains of protozoans, microscopic animals, or plants—called kerogen. When kerogen-bearing shale is buried deeply enough and for millions of years, the natural heat and pressure of the Earth can convert the kerogen to oil (and/or gas). However, in Utah’s oil-shale deposits, much of the kerogen-bearing rock is close to the surface and therefore has not yet generated hydrocarbons. The oil industry has for years attempted to develop economic techniques to artificially “cook” the kerogen, thus speeding up the process from millions of years to days. (Estonia and China produce significant amounts of oil from their oil-shale deposits that are organically richer than those in the Green River Formation; environmental regulations are also much less stringent in these countries.) Potential Green River Formation oil shale reserves based on 30 gallons per ton of rock are almost 20 billion barrels of oil. So what is shale oil? It’s just that—ready-to-be refined oil produced from shale. When organic-rich shale (which can be deposited in marine or lacustrine [lake] environments) is buried for millions of years (or is now “mature”) and the kerogen has been naturally “cooked,” pressure can force the newly generated oil and gas to migrate from the shale beds (also referred to as hydrocarbon source rocks) to traps in porous sandstone or limestone reservoirs where it can be produced from typical conventional vertical wells. Any remaining oil in the shale is—you guessed it—shale oil. Shale, like sandstone, contains pores capable of storing hydrocarbons. However, these pores can be extremely small and poorly connected to each other (permeability is the measurement of how well-connected the pores are and, thus, the ability of fluids to flow through a rock), making it difficult for fluids to flow through the shale. The word “tight” is often used to describe this characteristic. Sometimes the shale beds are naturally fractured by hydrocarbon expulsion or the same tectonic forces that create folds, faults, and other geologic structures. Fractures provide additional pore space and increase the permeability of the shale. Thus, shale that is organic-rich, and mature in terms of burial history and oil generation, may be a potential shale-oil drilling target. Prior to 1990, finding shale oil was a hit or miss undertaking. A vertical well needed to encounter numerous natural fractures in the oil-bearing shale just right to make a commercial discover. One such successful discovery well is the Long Canyon No. 1, located about1 mile north of Dead Horse Point State Park. Drilled in 1962, the well encountered the Cane Creek shale, as a fractured, overpressured zone in the Pennsylvanian Paradox Formation, which was deposited 306 million years ago in a warm, shallow inland sea. The Long Canyon well has produced over 1 million barrels of shale oil! However, this well is an exception rather than the rule. Two technologic achievements regarding shale oil have come into play since about 1990—horizontal drilling and improved hydraulic fracturing (fracking). Wells can now be drilled and steered horizontally in a targeted layer of rock (even if it is relatively thin) for thousands of feet, and thereby dramatically increase the number of natural fractures encountered. Additional fractures are created through fracking (see article by Robert Ressetar, Survey Notes, May 2012, v. 44, no. 2). Water is pumped down the well under pressures high enough to locally fracture the shale, significantly adding to the natural fracture system and thereby allowing the trapped shale oil to flow to the well. To keep the natural and new artificial open fractures from closing due to the pressure of the overlying rock layers, sand or other materials of various sizes (called proppant) is also pumped into the fracture zones to provide porous pathways for fluid flow. With the advent of horizontal drilling, several new Cane Creek shale oil fields were discovered near the Long Canyon well in the 1990s. Pump jacks can be seen along Utah Highway 313 near Dead Horse Point State Park. These and nearby wells have produced nearly 3 million barrels of shale oil. Since the series of new Cane Creek shale oil discoveries in the 1990s, drilling in that area has been sporadic. On the bright side, two new Cane Creek shale oil discoveries have been announced in 2012 by Fidelity E & P Company and Stone Energy Corporation. But these pale in comparison to the drilling activity for shale oil in the Late Devonian-Early Mississippian (370 to 345 million years old) Bakken Formation in the Williston Basin of western North Dakota and eastern Montana. There are three principle layers or formation members in the Bakken. Although oil was first discovered in the Bakken in 1951, only recently was the potential of the middle member recognized. The U.S. Geological Survey (USGS) issued a report in 2008 estimating 3.65 billion barrels of oil is recoverable from the middle Bakken, based on the use of horizontal drilling and new fracking techniques. Drilling activity for the Bakken shale oil play has exploded with hundreds of wells being drilled and hundreds planned for years to come. The town of Williston, North Dakota, is booming with the creation of thousands of new energy-related jobs. Recent studies by the UGS and the USGS indicate additional shale oil potential in the Cane Creek as well as other organic-rich shale zones in the Paradox Formation (Chimney Rock, Gothic, and Hovenweep shales). The USGS (March 2012) published a report estimating the total undiscovered, recoverable oil resources in these shales of the Paradox Basin, southeast Utah and southwest Colorado, could now be as much as 471 million barrels of shale oil, an increase from the 1996 estimate of 190 million barrels. In Utah’s Uinta Basin, operators are targeting the deep Uteland Butte zone in the lower Green River Formation—a highly fractured, 30- to 40-foot thick unit similar in rock characteristics to the middle Bakken Formation. Recent wells using horizontal drilling and fracking have been very encouraging, with estimated recovery from 150,000 to 275,000 barrels of oil per well. Whether the Uteland Butte, Cane Creek, or other potential shale-oil zone becomes the next Bakken play remains to be seen. The UGS is actively evaluating these potential oil plays. One thing seems certain: while oil shale remains the energy of the future, the future for shale oil may be now.